High school senior Puja Dharod conceived the idea for the Puja Foundation after working at her family's restaurants as a way to help employees in financial need due to an illness, injury or loss. We called it the Puja Foundation because my name means to pray. When people are in need, they pray, and the Puja Foundation is showing them that prayers can be answered. Puja Dharod is the antithesis of the modern teenager. She has no interest in video games or lounging for hours in front of the TV. 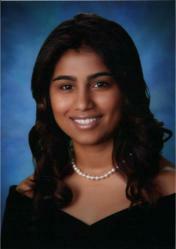 Instead, Puja spends her free time volunteering at an assisted living facility or helping with her father’s business. She enjoys hanging out with her parents, adores her older brother, and prefers a round of golf to a trip to the mall. Rebellious she is not. It is hardly surprising, then, that the bubbly high school senior is also the executive director of the Puja Foundation, a non-profit organization she created to help people in times of crisis. Specifically, the organization provides financial aid to employees of Apple Texas Restaurants, Inc., her father’s company, which currently owns and operates numerous Applebee’s franchise locations throughout northern Texas. “Everybody has problems in life, and some are able to deal with them more easily than others,” says Puja, explaining the motivation for her namesake foundation. While working at Applebee’s restaurants during summer breaks, she got to know several of the employees and recognized that many had few places to turn in the event of an emergency. “My dad always pushes that we should take care of the people that work for us, so I thought, why not set up a foundation to do that?” says Puja. Planning began last year, and in January 2011, the Puja Foundation was born. Any of the several thousand employees of Apple Texas Restaurants can contribute into the program through a voluntary one-time or recurring payroll deduction, and any employee can apply for a grant if they have a need. Since its launch, the Puja Foundation has already helped ten individuals. Their stories are heart wrenching: One employee lost her home in a fire. Another had to take time off work while she was hospitalized and could not pay her bills. A newly hired waitress had fled a physically abusive relationship, and one of her co-workers learned that she was sleeping in the back of a pickup truck with her daughter while they waited for an opening at a local women’s shelter. Often, the request for a grant is made by a manager on the associate’s behalf. Because the need for financial assistance frequently is urgent, requests are generally reviewed within 24 hours by Puja and a five-member board via conference call, and checks sent out the next day. “It’s a big responsibility to assess a person’s crisis and know you hold the key to helping somebody,” says Cheryl Green, Director of Human Resource at Apple Texas Restaurants, who sits on the review board. “But it’s also a blessing to be in a position to help someone in need,” she adds. To help somebody, you also have to care about them, Green says. For this reason, Apple Texas Restaurants strives to build lasting relationships with its associates and make them feel like part of the extended family. Owner Sunil Dharod, Puja’s father, is hands-on, visiting each location, talking to the employees, and ordering off the menu. Her mother is the director of the Puja Foundation. Puja started working at the Apple Texas office as a young girl, organizing files and answering phones while she watched her father in action. As she grew older, she would work every summer at the office and eventually at several of the restaurants. “I want to join the business with my brother and grow the company,” she says of her long-term plans. Her older brother, Chris, is a business finance major at SMU. Puja plans to study business finance, as well, and looks forward to becoming even more involved with her father’s enterprise. Last summer, Puja got work experience to better understand the operational side of the franchise. It was during this time that she saw the impact that a sudden catastrophe could have on an associate’s life, and how they often have nowhere to turn. She heard about a private non-profit called Heidi Foundation Inc. that provides grant assistance to people in need and wanted to do the same thing at her family’s company. At age 16, she pitched the concept to her parents, and the wheels were set in motion. The Puja Foundation is a non-profit 501(c)(3) that provides financial assistance to the employees of Apple Texas Restaurants, Inc. who find themselves in a financial crisis brought on by a catastrophic life event. While working with her father, Sunil Dharod, in the family business during summer vacations, Puja Dharod witnessed many unfortunate events, from medical issues to home fires to the unexpected death of an immediate family member. These experiences compelled her to establish The Puja Foundation to empower associates to help their fellow co-workers in their time of need. For more information, visit http://www.pujafoundation.org.